Having some leftover cream in the fridge, I decided to make crème brûlée yesterday. This classic custard dessert of questionable origin is ubiquitous these days, found on almost every fine dining restaurant menu, usually as the traditional vanilla bean version or sometimes with a modern flavour twist. 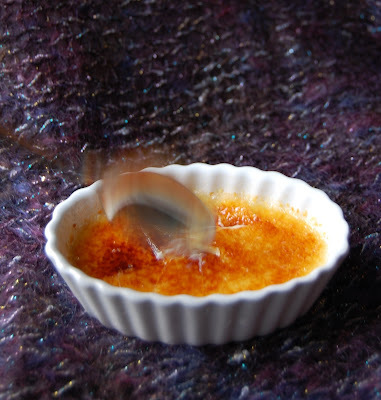 Because it is made with just cream, possibly some milk, sugar, and egg yolks, crème brûlée can be a blank canvas into which teas, spices, herbs, liqueurs, chocolate, fruits, nut pastes, and whatever you dare are added. Although the custard part may change, the smooth glistening thin layer of caramelized sugar is, undoubtedly, the main reason I enjoy the crème brûlée experience, both as creator and consumer. At home, my small hand-held butane torch, which was a gift from a friend given years ago, is perfect for small-scale use. During my practicum at the Pan Pacific, I recall cradling two industrial propane torches in each arm to caramelize over 300 crème brûlées for a large function. The roar was deafening and I felt strangely powerful, not unlike some fire wielding superhero. These days, my enjoyment is from the satisfying thwack of breaking the caramel layer to enter the creamy goodness underneath. Posted by Charmaine at 10:18 a.m.
MMMMMM....That looks yummy!!! Have you tried making it with a ginger infusion. Oh it is fantastic. Sounds like I need to get my torch out too!! January 29, 2008 at 9:00 a.m.
i was in heaven...best dinner ever...thanks for sharing. September 9, 2008 at 5:58 p.m.